So you've done the walk across the Brooklyn Bridge. Now, where are you? Many people who walk across the Brooklyn Bridge would like to see a Brooklyn neighborhood. And the nearest neighborhood to the Brooklyn Bridge is the unique little corner of Brooklyn with the charming name of DUMBO. 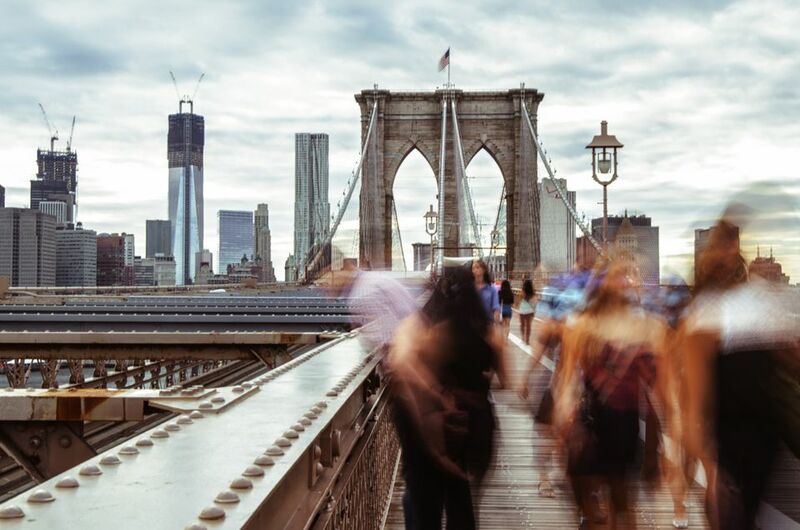 DUMBO has an appealing mixture of elements: historical district, cultural destinations, waterfront, spectacular views of the Manhattan and Brooklyn Bridges, not to mention the Manhattan skyline and NY Harbor, and fabulous Brooklyn Bridge Park. Here is how to walk from the Brooklyn Bridge pedestrian path to DUMBO and Brooklyn Bridge Park. It's a five-minute walk to DUMBO from the first exit off the Brooklyn Bridge pedestrian walkway. There's a nice map of attractions by the Washington Street underpass stairway. Take the first exit off the Brooklyn Bridge pedestrian walkway. Note: There are two pedestrian exits when walking across the Brooklyn Bridge from Manhattan to Brooklyn. The first exit is the most direct route to DUMBO. Take the path off the pedestrian walkway that bears to the left and slightly downhill as you face Brooklyn. Follow the path to a small stairway. Go down the stairs to an underpass on Washington Street. The Washington Street underpass is about two blocks from Front Street in the heart of DUMBO. Turn left and head downhill, toward the East River and Manhattan skyline. When you cross under the highway overhead, you will see the industrial buildings, shops, and restaurants of DUMBO. Turn right on Tillary Street and head toward Cadman Plaza West. Follow Cadman Plaza West until it becomes Old Fulton Street. Walk downhill toward the water. You will see Grimaldi's pizzeria, the floating concert hall Barge Music, and the skyline of Manhattan. On the left is the entrance to Brooklyn Bridge Park. On the right, under the Brooklyn Bridge, is the beginning of DUMBO.